Media-Maker with over 35 years producing media for business, education and government. "Shoot film not people." Ira Sherman Slaven was born in Taylor, Michigan on February 1, 1942, the third child of AY and Ruby Slaven. Ira was educated in Taylor Schools and graduated from Taylor Center High School in June 1960. He joined the U.S. Air Force and was stationed at K I Sawyer Air Force Base in Marquette and then at Kincheloe Air Force Base in Sault Ste. Marie, Michigan. After his discharge he attended Henry Ford College, studying for a career in Mortuary Science. While working as a medical technician for Taylor Ambulance in 1965, he met Gayle Dornton in the Emergency Room of Oakwood Hospital. They were married on October 5, 1968 and were blessed with five children, Joseph, Judith, Joanna, Jayson and Jessica. They have six Grandchildren, with number 7 & 8 on the way. While working for the ambulance company Ira accepted a challenge from a fellow worker and wrote the exam for a position with the Taylor Fire Department as a Firefighter. Ira was hired shortly thereafter and retired in 1996 as Fire Inspector. Ira began his Masonic journey while serving with the Air Force in Sault Ste. Marie when he petitioned Bethel Lodge #358. After his discharge he transferred his membership to Golden Ark Lodge #595 and served as the Secretary for a total of more than 23 years, serving as Worshipful Master in 1977and is currently a Life Member. 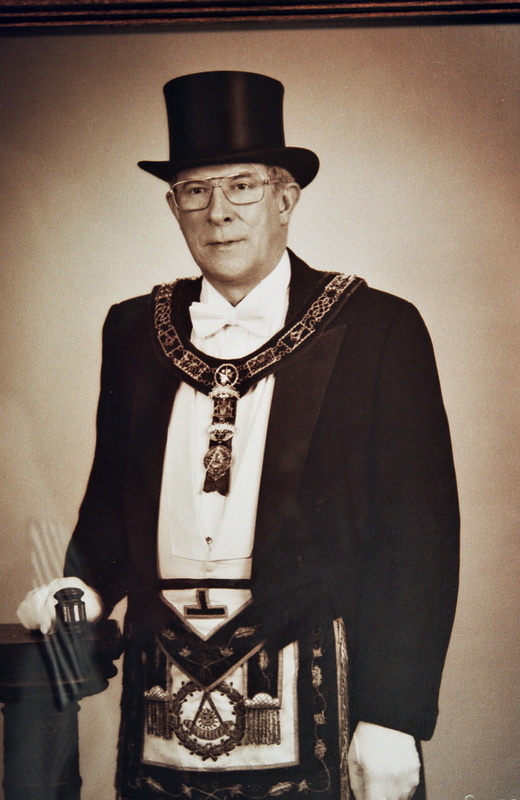 Ira’s other Masonic affiliations include a plural membership with Allen Park Key Lodge #580; Valley of Detroit Scottish Rite, where he served as Most Wise Master of Mt. Olivet Chapter of Rose Croix; Detroit Commandery No. 1, K.T. ; Monroe Council #1, R.& S.M. ; Monroe Chapter #1, R.A.M. ; Moslem Temple Shrine; Nankin Chapter, O.E.S. ; and Al Matta Grotto. 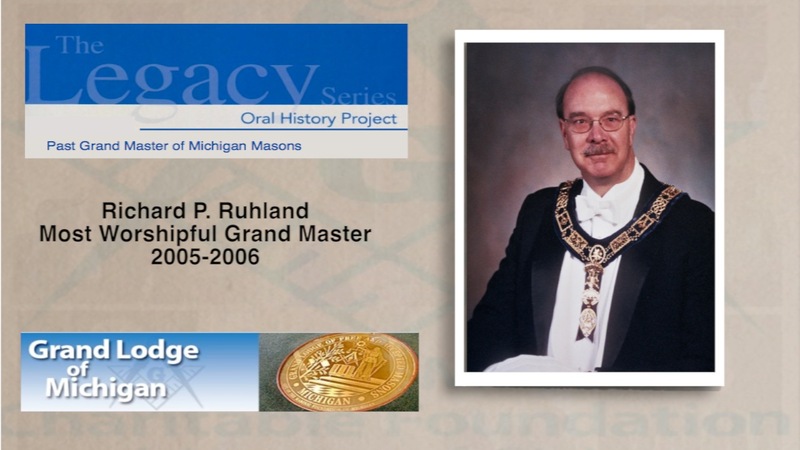 The Legacy Series: Oral Histories with Masons of Michigan. In this segment, Keith Bankwitz, Dir. of Philanthropy for the Michigan Masonic Charitable Foundation, interviews Chuck Zilch, Past Master of Edmore Lodge No. 360. The interview was conducted at Pathways the Masonic Retirement Community in Alma, MI. The date was June 5, 2013. Robert W. Stevens was born on March 21, 1943 in Saginaw, Michigan. He graduated from Arthur Hill High School in Saginaw and began employment with the General Motors Corporation as a Journeyman Patternmaker. He retired in December 1994 after thirty-three years with the Corporation. 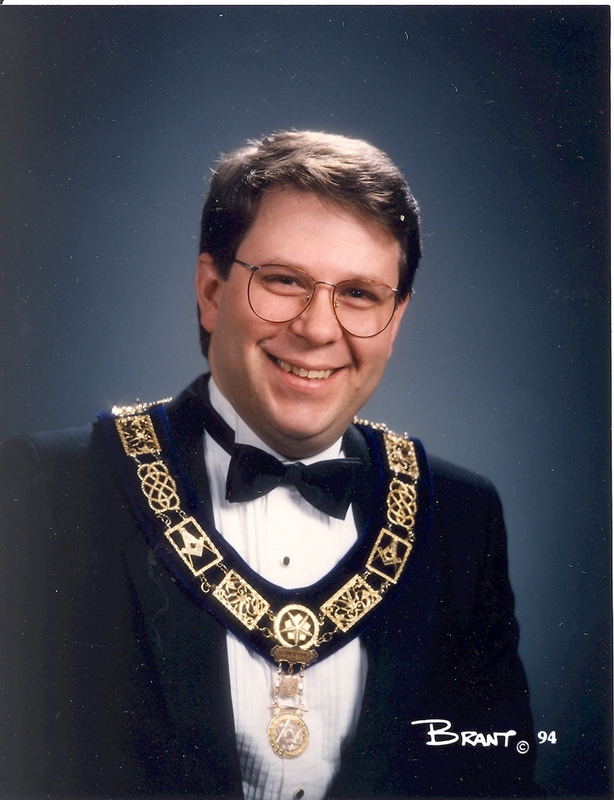 At that time, he became the Assistant to the Secretary of the Scottish Rite Bodies in the Valley of Bay City, and on July 1, 1996 assumed the office of Executive Secretary. He married Trudy Korniski on September 28, 1963. They were blessed with a son and a daughter. He became a member of George Washington Chapter, Order of DeMolay in 1958. He was honored in 1996 by the Order of DeMolay when he received the Legion of Honor and served as Secretary-Treasurer of Saginaw Valley Preceptory, which is sponsored by the Valley of Bay City. 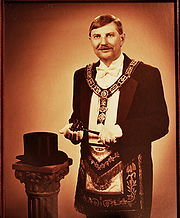 He was raised as a Master Mason on September 24, 1964 in Salina Lodge No. 155, F. & A.M. of Saginaw. He served the Lodge as Worshipful Master in 1971 and later served as its Treasurer for several years. He also served the Grand Lodge as District Deputy Instructor for District 22A. 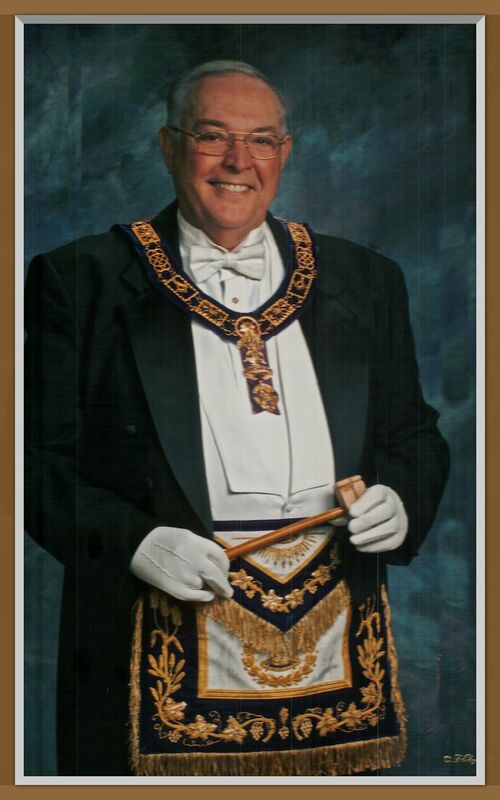 He was appointed by Grand Master William Skrepnek as Worshipful Grand Marshal of the Grand Lodge in January of 1992. He has served faithfully through the line of the Grand Lodge until he was installed as Most Worshipful Grand Master on May 30, 1997. He has honorary memberships in Saginaw Lodge No. 77, Pioneer Lodge No. 79, Metamora-Hadley Lodge No. 210, Centre Lodge No. 273, Tawas Lodge No. 274, St. Charles Lodge No. 313, Lake City Lodge No. 408 and Merrill Lodge No. 411. He is a member of Martha Washington Chapter No. 113, O.E.S. ; Saginaw Valley Chapter No. 31, R.A.M. ; George Hill Council No. 85, R. & S.M. ; St. Bernard Commandery No. 16, K.T. ; Northern Michigan York Rite College No. 16; Pythagoras Council No. 66, A.M.D. ; Elf Khurafeh Shrine Temple, A.A.O.N.M.S. ; Saginaw Court No. 74, R.O.J. ; and St. Martin Conclave, Red Cross of Constantine. 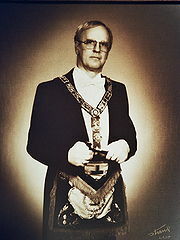 He has been very active in the Scottish Rite since he received the degrees in the Valley of Bay City in February 1967. He served as Sovereign Prince of the Bay City Council of Princes of Jerusalem in 1994-96. For his many services to the Craft, he was created a Sovereign Grand Inspector General, 33°, Honorary Member of the Supreme Council on September 24, 1991 in Indianapolis, Indiana.